Thousands Of Fire Evacuees To Spend The Holiday Without Homes The community shaken by California's Camp Fire is finding ways to come together for Thanksgiving. 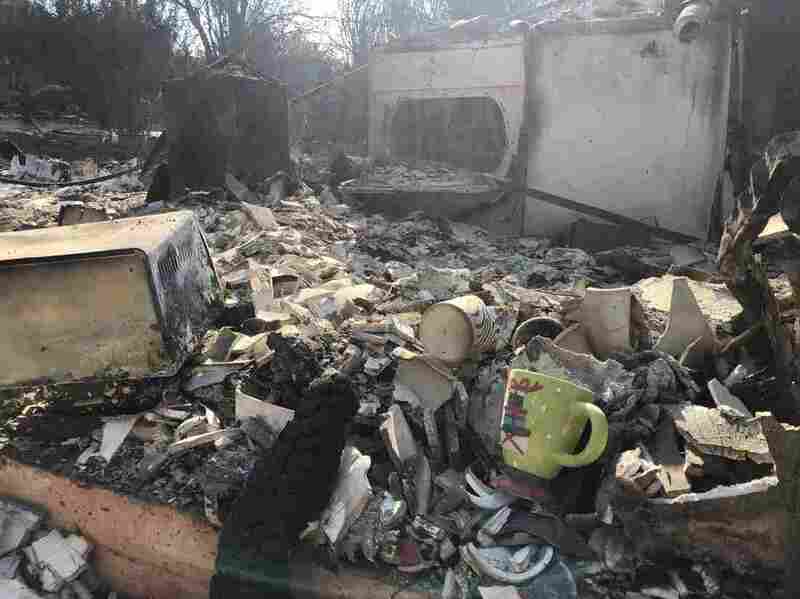 A holiday mug is seen among the wreckage of what was once someone's kitchen in Paradise, California. Evacuee Roxanne Peters had planned to prepare food tomorrow, for Thanksgiving dinner. "I was celebrating at two different houses. We were invited to two different places, and I was cooking, you know, potluck," she said. Both those homes burned to the ground in the historic Camp Fire. The scale of the fire's destruction is so spread out that very little of the towns of Paradise, Magalia and Concow remain. So far, the fire scorched 230 square miles — an area the size of Chicago. "I'll be giving thanks this year that we made it out alive," Peters says. So many evacuees have fled to nearby Chico, prompting local businesses to try and give them a place to exhale. "When you see them come in they have ash on their clothes. Or their face has soot on it. Because you don't know what they were doing," says Breanna Fischer, manager the Buffalo Wild Wings near the disaster recovery center. It's brought a stream of customers with different stories of survival. The restaurant is usually closed on Thanksgiving Day. But tomorrow, she and the other managers decided not just to stay open, but to host a free feast for hundreds of fire survivors. "It's all on us. This is a family event, basically," Fischer said. Inside the giant walk-in freezers in the back, forty giant turkeys are lined up, waiting to be deep-fried in the kitchen's seven fryers. "We're gonna test one tonight, see how long it's gonna take to cook, and that's what it's gonna be," Fisher says. The restaurant can seat 240 in all — and it's accepting reservations until the place reaches capacity. Elsewhere in town, the non-profit group World Central Kitchen, founded by celebrity chef Jose Andres — is teaming up with the town of Paradise, Chico State University and the Sierra Nevada beer brewery, headquarted in Chico, to make 15,000 Thanksgiving meals tomorrow. "It's definitely a huge undertaking," says Elaine Kramer, an associate dining director at Chico State, which is turning over two of its dining halls to any evacuees who show up. "I hope it...makes somebody feel better, even if it's just for a very short amount of time," Kramer says. Volunteers from the community will help with serving the food — the volunteer sign up filled up within hours. At Buffalo Wild Wings, all the staff will also work for free. Manager Breanna Fischer says their focus is giving fire victims some semblance of normal holiday. "Where are they supposed to go? They don't really have a home, so... It's kinda like, like, our responsibility to do it," she says. So many are temporarily homeless. But tomorrow they won't be hungry.